A sight members of this shattered community referred to as "nearly impossible to look at." UNIONTOWN, PA—An elderly man currently struggling to walk up a flight of steps at the local post office has rocked this community of nearly 12,000 people, leaving many shaken and devastated by the slow-moving, wheezing octogenarian's inability to perform what was once an effortless physical task, sources confirmed Thursday. Described by onlookers as both hunched over and more than likely racked with thoughts of how much his body has deteriorated over time, the man began his ascent to the top of the 9-foot staircase at 9:45 a.m. By the fourth step, the man reportedly started using the handrail to stabilize himself—a sight that emotionally crippled the already grief-stricken community. At press time, crushed town sources said the image of the man stopping on the seventh step to catch his breath would forever be seared into their brains. 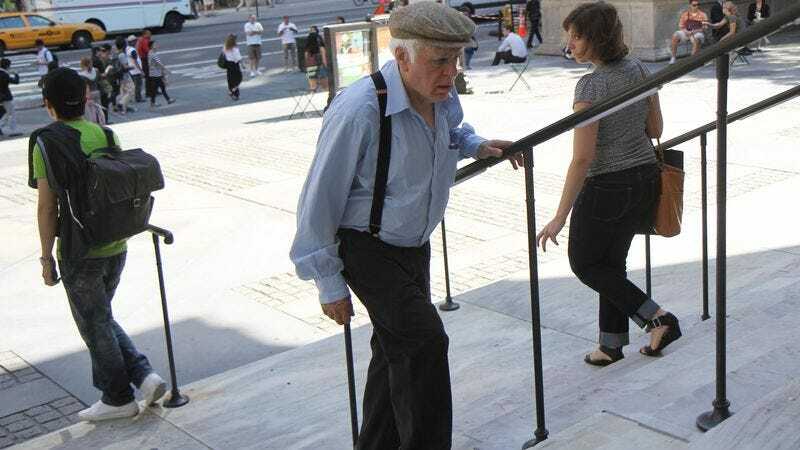 "The elderly man's lack of stamina and mobility has left all of us in a state of shock," said Uniontown mayor Ed Fike, who added that watching younger people swiftly pass the senior on the steps has only exacerbated an already terrible situation. "Unfortunately, the worst has yet to come. He still has six more steps to go, and I don't see him becoming any more limber or getting any sort of boost in energy during that time." "Until he reaches the top, this town needs to deal with the likelihood that this gentleman is currently wondering how much longer he'll be able to use staircases unassisted, or worse yet, if there's any point in being alive if you can't even walk up 13 measly steps," he added. "Christ, they're pretty shallow steps, too." According to residents, the town has been demoralized not only by the sheer amount of energy the man must summon to make it up each step, but also by the man's near inability to lift his knees high enough to place his feet securely on the edge of the next stair, and then the next, and then the next. In addition, sources confirmed the elderly man periodically removing his handkerchief to wipe away sweat from his forehead has taken a significant toll on the community, as has his weary yet stoic expression, which passersby said indicates the man long ago accepted, with humility and grace, the fact that he will have to repeatedly endure humiliating physical hardships every single day for the rest of his life. "My God, it's going to take him five minutes to get up there," said real estate agent Michael O'Connor, who later speculated that if the old man has such extreme difficulty walking up steps, he more than likely can't even walk on flat ground without tiring easily. "I bet 50 years ago he was bounding up steps two at a time, and now look at him. He just glanced up at the top stair as if to calculate whether or not he has enough energy to actually make it. I can't watch this anymore." "Why is he carrying those bags?" said distraught 42-year-old resident April Carlson, referring to two Rite Aid bags the elderly man is holding in each hand. "There's no way those bags are making this any easier for him. Doesn't he have anyone to help him out with stuff like that?" Further adding to the community's distress is speculation that the man probably once led an extremely active life, fighting for his country in World War II, playing high school football, and taking his loving wife out dancing. Citizens later concluded that the man's wife is most likely dead, that he lives alone, and that his inability to get around is a constant reminder of everything he's lost. While residents said they would try to recover from the sight of the man looking back at the bottom step as if he might quit altogether, the majority noted it would be impossible to forget his ordeal. "I have encouraged our citizens to continue on and live life as normal," Mayor Fike said. "But I feel like that is going to be impossible. The truth is, at some point, no matter how healthy you eat, or how in shape you are, there will come a time when your body simply stops working. It breaks down. Muscles become weaker. The simple act of standing becomes nearly impossible. So if there is any lesson to be learned from today's events, it's that all of us, every single one of us, will suffer."